A beginner's question: I have to replace the right parking (dim) light-bulb of my DAF 46. I see that the reflector is hold by three screws (that are a little rusted), but the owner's manual is quite vague about how the reflector can be removed. Not sure if I should pull it firmly or turn all the screws until the reflector comes out. In any case, will the beam alignment be lost after putting back the reflector ? Thank you for your answers. Psst: want some yellow headlights? Hi Andrew, thank you for your reply. I actually solved the problem: the three screws are clipped into plastic rings located on the edges of the bowl. To remove the reflector, I had to pull firmly each of the screws (in my case some of them looked to have been glued, so I used a small flat screwdriver between the nut at the end of each screw and the plastic ring. This way, the reflector came out along with the screws (that are retained by the tapped holes of the reflector brackets). 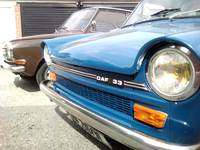 I have Cibié headlamps using this system, not sure if it was the case of all the DAF 46... And by the way, the dim/parking bulb was OK, there were just two wires disconnected behind the reflector. Now the lights work fine . Regarding yellow lights, I have them already (for the dipped and high beams), they are legal in France (where I live) for old cars. That is correct - a firm pull and the light unit pops out. All DAFs used Cibie headlight units. Some like your 46 were convex along with 33 and 66s. The 44s and 55s were concave. And well done re yellow headlight bulbs - Andrew and I are big fans and yes, we are allowed to use them in the UK!